UNIDROIT participates in global efforts intended to address the objectives of food security and Several instruments adopted by UNIDROIT over the last few decades dealing with International Commercial Contracts and trade financing (in particular Leasing and Factoring) are relevant in the areas of agricultural production and investment. In 2010, acknowledging the importance of this particular sector, the UNIDROIT General Assembly decided to include aspects of the private law of agricultural finance in UNIDROIT’s Work Programme. The first initiative, laying the basis of the future work, was a Colloquium on "Promoting Investment in Agricultural Production: Private Law Aspects" held at UNIDROIT in Rome from 8 to 10 November 2011. Since then, UNIDROIT has engaged in the preparation of rules to promote an enabling legal environment and best practices in contract farming relationships and in agricultural land investment contracts, and to facilitate the acquisition of high-value equipment for agricultural production. 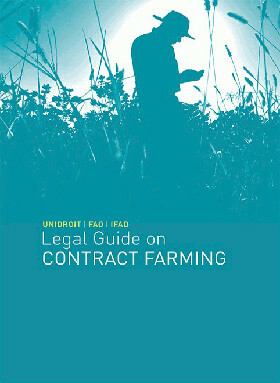 The UNIDROIT/FAO/IFAD Legal Guide on Contract Farming intends to promote good practices between farmers and buyers of agricultural commodities by enhancing knowledge and awareness of the legal regime applicable to contract farming operations. The practice of producing under a contract is used for a broad array of agricultural commodities in many countries of the world and is growing significantly in developing countries. Contract farming does not disrupt farmers’ rights over the land and under enabling conditions may deliver substantial economic and social benefits to the parties and the community. One key element of the success of contract farming arrangements is the capacity of the parties to build stable, commercially sound and fair relationships, based on clear commitments and mutual compliance and supported by an enabling legal framework. The Guide is a useful tool and reference point for a broad range of users involved in contract farming practice, policy design, legal research and capacity-building. It can contribute to create a favourable, equitable and sustainable environment for contract farming. UNIDROIT, in collaboration with FAO and IFAD, is preparing an international instrument on agricultural land investment contracts for use by legal counsel working on the leasing of agricultural land, whether from a State, local community or private party. The future instrument – which is being developed by a Working Group of renowned experts, representatives of international Organisations and stakeholders and is to build upon the UNIDROIT-FAO-IFAD Legal Guide on Contract Farming and the UNIDROIT Principles of International Commercial Contracts – is not to endorse large-scale land acquisitions and is to raise awareness about alternative investment models. In acknowledging that land acquisitions continue to occur, however, the instrument is to help ensure that leases of agricultural land are done responsibly and that stakeholders’ rights, including those of legitimate tenure right holders, are protected and respected in a way that is fully consistent with principles and internationally accepted standards for the promotion of secure tenure rights, equitable access to land and responsible agricultural investment, as reflected in the VGGT and CFS-RAI Principles. Information regarding the background on this work and its current status, including Working Group meeting summaries and documentation is provided here. A brief overview of UNIDROIT’s work on agricultural land investment contracts – together with the draft in-progress outline and a list of resources – is available here. The Cape Town Convention together with its various Protocols is designed to bring significant economic benefits to countries at all stages of economic development, and in particular to developing countries by bringing within their reach commercial finance for mobile equipment that has previously been unavailable or available only at relatively high cost. A sound, internationally adopted legal regime for security, title-retention and leasing interests will encourage the provision of finance and reduce its cost. In the area of agriculture in particular, the future Protocol will allow enterprises to acquire equipment they would otherwise not be able to acquire and thus to permit them to optimise their activity. It will also allow producers of equipment to export to markets that without such a Protocol would remain closed to them. © 2018 UNIDROIT. All Rights Reserved.